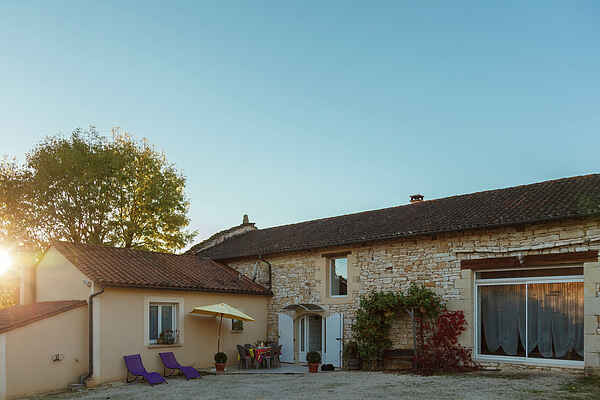 Hard to imagine maybe ... but this beautiful holiday home with nice kitchen in charming Cazals (1km) was once a barn. During sunny days you can move your garden furniture to exactly that one perfect place. You choose one of the two terraces or the large fenced lawn with its delicate shadow areas and fruit trees. There is also a (fenced) pond. Daily groceries can be done on foot in Cazals: shops, bakery and restaurant. It is not lacking on French atmosphere! Visit the cute Les Arques (6km) with the Zadkine museum and the neat restaurant La Récréation. Also impressive - but in the way of more pompous - is the huge castle of Bonaguil (29km). In medieval Cahors (29km) you can do great shopping. Or you visit the fortress bridge. In Puy-l'Evêque (24km) you can rent a canoe for a refreshing trip over the Lot. ALso well worth discovering (possibly by bike, you can hire one in Villefranche-du-Périgord, 15km) are picturesque towns like Domme (26km) and La Roque-Gageac (29km). There's a swimming pool in Salviac (7km). You can play golf in Belvès (28km) and Vitrac (29km).